If you can't resist nature and love to hear the bird's sing, head to Keoladeo Ghana National Park. 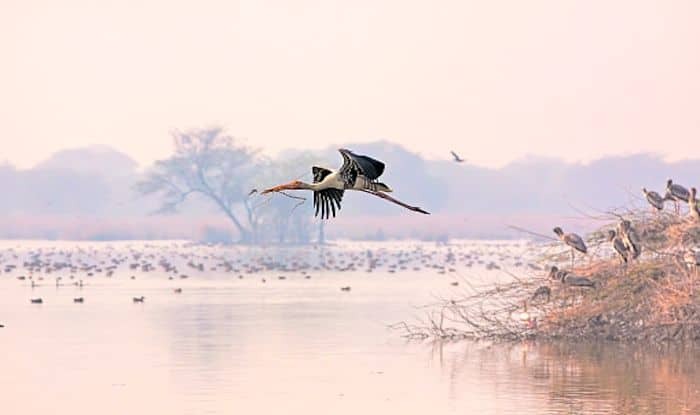 Keoladeo Ghana National Park, formerly known as Bharatpur Bird Sanctuary lies between India’s two most historic cities – Agra and Jaipur. It’s about 190km from Delhi, and is famous for being Asia’s finest birding area, with being home to over 380 resident and migrant species. If you’re a birder, this is going to be a surreal experience for you. You could bring out that camera and capture some stunning birds including the Common, Demoiselle and the rare and elusive Siberian Cranes and the painted storks. It is also an excellent place for wildlife watching; keep an eye out for the golden jackal, striped hyaena, fishing cat, jungle cat, deer, nilgai, sambar, blackbuck and wild boar. The park derives its name from the temple of Keoladeo dedicated to Shiva, and the dense ‘ghana’ vegetation around. During the cool winter months it is possible to spot large Indian Pythons basking in the sun in the sanctuary. Though it’s not a particularly large park, the well-defined trails can be easily covered on foot or on a cycle. You can also hop onto a rickshaw; the rickshaw pullers are trained by the park management in bird watching and are quite knowledgeable. You could also opt for a boat trip early in the morning or late evening for a rewarding experience. As one of the world’s most important bird breeding and feeding grounds, it’s important to carry binoculars to Keoladeo Ghana National Park. You can couple your visit to the park with nearby attractions such as the Government Museum in Bharatpur which gives a glimpse into India’s past splendour. Not far from the museum is the Bharatpur Palace – an excellent blend of Mughal and Rajput architecture. There’s also the mighty Lohagarh Fort and the Deeg Palace that are worth a visit.